It’s Time for “Long Island’s Got Talent” 2016! 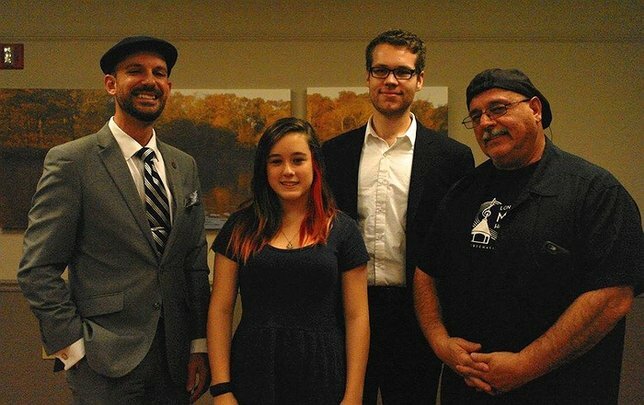 Tom Manuel, Judge (Founder of The Jazz Loft); First Place Winner Julianna Gape, Setauket; Kyle Foley, Judge (Stony Brook University Music Department), James Faith, Judge, 2nd Vice Chairman, Long Island Music Hall of Fame). Stony Brook, NY - February 18th, 2016 - Attention Long Island students! Can you carry a tune? Is a musical instrument your specialty? If so, get your audition DVD or YouTube video submitted now for Long Island’s Got Talent 2016, hosted by the Ward Melville Heritage Organization (WMHO). Created by WMHO’s Youth Corps, the event gives Long Island students the opportunity to show off their talents this spring. It’s open to students 10-17 years of age in Nassau or Suffolk County who must still be in high school at the time awards are given in October 2016. Talent must be non-professional vocal or musical instrument performances. The entry deadline is March 16 and there is a $25 entry fee. Five Towns College will award a $6,000 scholarship to the 1st place winner and $5,000 to the 2nd place winner. All finalists receive a $2,000 scholarship or more, depending on place. Those who are contacted after submitting their audition will be asked to perform at the first round performance on April 8 at WMHO’s Educational & Cultural Center, 97P Main Street in the Stony Brook Village Center. Finalists chosen can perform at WMHO’s Sunday Summer Concerts series and finals will take place on October 21, 2016 when the winners will be chosen. For full details and Official Entry Form, call 631-751-2244 or visit the Stony Brook Village website. Created in 1998, the WMHO Youth Corps is a student volunteer group operating under the auspices of The Ward Melville Heritage Organization. They provide growth and leadership experiences for young people grades six to twelve through various activities and community service projects. Is Government Hiding Behind the Rhetoric? Subject: LongIsland.com - Your Name sent you Article details of "2016 Long Island's Got Talent Entry Deadline is March 16th"